When you attend a football match, use a train station or visit an amusement park there is a high chance you will have to use a turnstile. While in the modern era their primary job is to limit entry to one person at a time, the original purpose of such gates was to allow people to pass from field to field, while keeping their livestock penned in. Clarence Saunders, who founded the Piggly Wiggly chain of supermarkets in the early 20th century, is credited with being the first to install turnstile gates into his shops to help to avoid overcrowding and mass hysteria, as shoppers flocked to the world's first supermarket. The technique soon caught on as a means of limiting and controlling the entry and exit, and before long they were being used in venues that hosted large crowds. The first recording of turnstiles being first used at a UK sporting venue was at the original Hampden Park stadium in Glasgow. They were also installed in 1915 at Blackpool Pleasure Beach, in order to help control the summer crowds. Why Would You Use Turnstiles as an Access Control System? What Are the Different Types of Turnstile Gates? Turnstiles may be more beneficial to your organisation if they are integrated with other security systems such as CCTV, intercoms and barriers. 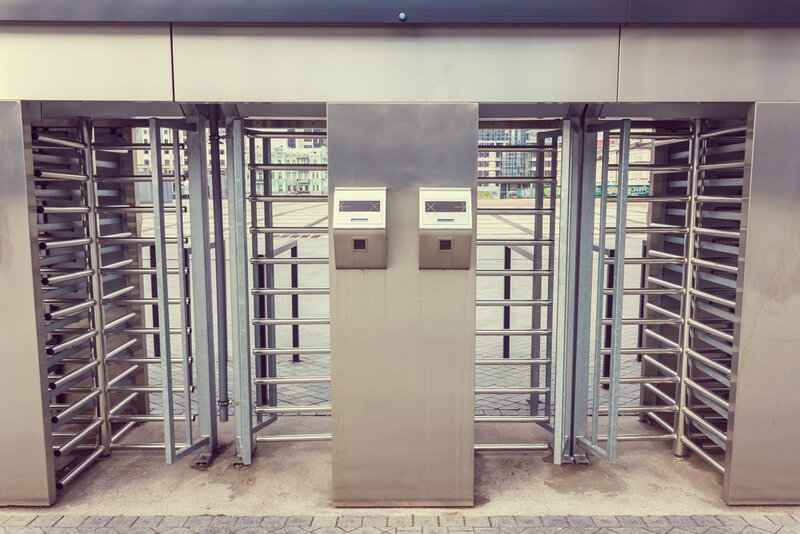 There are various types of turnstiles which are best suited to different purposes, such as crowd control, controlled admission into a venue or to provide security. Swing Gate - These can be used for either single direction or multi directional access, which allows both entrance and exit through the same gate. Swing Gates are not as secure as other designs but they can still be used to successfully restrict entry to areas. They can feature manual or automatic controls. Drop Arm - These turnstile gates have three arms, which spin as the user enters. They are normally operated using a coin, ticket or card. They can also be activated remotely using push button release. The major issue with this type of barrier is that it is relatively easy for people to jump over them. Full Height Turnstiles - These turnstile act like a revolving door and reach a height of around 2 metres. This height makes it impossible for someone to jump over the barrier, making it popular in football stadia and other sporting arenas around the globe. Operated using a number of methods such as, card reader, via a scanner or manually, these gates offer the best secure entry system. The installation of turnstiles provides a range of benefits, not only do they increase pedestrian safety by slowing down the rate of entry and crowding in reception areas and platforms, they also provide a vital means of assisting security screening before entering secure areas, such as a court room or airport. They also provide a way of ensuring that no revenue is lost when they are used to validate payment for entry. Interested in Improving Pedestrian Access? If you are interested in installing turnstiles at your premises or to discuss other pedestrian access systems please contact Ursa Gates today. Our team have over 25 years' experience in installing access control systems. You can reach us by filling in our Contact Form or on 0800 566 8174.